This article appears in the Feb./March 2015 issue of “The Wedge” newspaper. The first article of my new regular column for that paper. Children have an inborn need to play. They will do it naturally. They will explore whatever they can get their little hands on. I am not talking about playing soccer, or a musical instrument, though that’s not so bad. I am not talking about hurrying them from one “learning activity” to another, either. 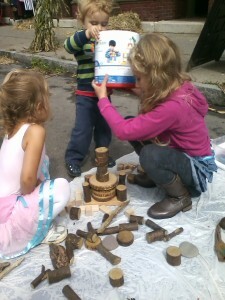 What I am talking about is child-lead, child-initiated free play. Studies have shown that children learn best through long periods of uninterrupted “free play.” This is the kind of play you see them engage in when they are left to their own devices–using toys, props, and other materials to explore, experiment and pretend. Children learn so much as they play. Their little brains are forming neural pathways through their experiences, as ideas become solidified through trial and error, experimentation, and exploration. As they repeat processes and build upon what they already know, those neural pathways survive the “pruning process” that naturally occurs in their brains and knowledge is retained, and solidified. Some of the most important learning takes place in the prefrontal cortex of the brain; it has been identified to be the area where Executive Functioning skills develop. Executive Functioning skills are considered to be the key indicators of success in school and throughout life. Self-control, delaying gratification and resisting temptation, reasoning, focusing attention, problem solving, and cognitive flexibility are some of these skills. A recent study by a team of researchers lead by Yuko Munakata at the University of Colorado and the University of Denver suggests that the greater amount of time children spend in self-initiated, self-lead, unstructured free play, the greater their Executive Functioning skills. The reverse is also true, more time spent in structured, adult initiated and adult lead play, the less children exhibit Executive Functioning skills. As our culture has become fast-paced, and over-scheduled, we should remember to stop and smell the roses and let our children do the same. We should make time for our children to simply be and to simply play. We should take a step back and take a breath and enjoy this wonderful time that is childhood. Comments Off on Children Need to Play!